Tanzania's Magufuli, a Reformist or Dictator? Tanzanian immigration authorities detained CPJ Sub-Saharan Africa Representative Muthoki Mumo, left, and Africa Program Coordinator Angela Quintal in Dar es Salaam on November 7. Dar es Salaam — Tanzania’s Immigration Services Department said on Thursday November 8 that it was yet to receive information about two staffers of the Committee to Protect Journalists (CPJ) Angela Quintal and Muthoki Mumo who are reportedly being held in the country. CPJ has released statement on Wednesday November 8 calling on the authorities in Tanzania to “immediately release” and return the passports of Ms Quintal, CPJ’s Africa program coordinator and Mumo, the organization’s sub-Saharan Africa representative. 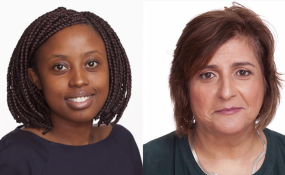 "We are concerned for the safety of our colleagues Angela Quintal and Muthoki Mumo, who were detained while legally visiting Tanzania," said Joel Simon, CPJ's executive director. "We call on the authorities to immediately release them and return their passports," added Simon in a statement. Reports indicate that people who identified themselves immigration officials searched the belongings of the two journalists and would not return their passports when asked. Further, reports say, they were escorted from Southern Sun Hotel in Dar es Salaam, the commercial capital and taken to an unknown location. They were in the country on a reporting mission, CPJ said in a statement posted on their website. Mr Mtanda said the immigration department was following up through its regional offices regarding the matter. The two journalists were in the country to try and ‘assess’ the level of Freedom of the Media, said the Acting Chairperson for Tanzania Editors Forum (TEF), Deodatus Balile. He said conversations underlined the disappearance of a journalist Azory Gwanda and the CPJ journalists asked what steps had been taken so far by the media in the search for Anzory, a journalist for Mwananchi Communications Limited who “disappeared” months ago. Mr Balile added that the [CPJ’s arrested journalists] had met heads of almost all media institutions in the country including the Media Council of Tanzania (MCT). “I have been shocked by these reports. We are following closely to know exactly what has happened,’’ he said. In another development, CNN reported that the US state department was “closely following” up the case of Angela Quintal and Muthoki Mumo. “We continue to engage the government of Tanzania…on a wide range of issues, including those related to human rights," the State Department said in a statement Wednesday.